Operation Pike was the code-name for a strategic bombing plan, overseen by Air Commodore John Slessor, against the Soviet Union by the Anglo-French alliance. British military planning against the Soviet Union occurred during the first two years of the Second World War, when despite Soviet neutrality, the British and French came to the conclusion that the Nazi-Soviet pact made Moscow the ally of Hitler. The plan was designed to destroy the Soviet oil industry, to cause the collapse of the Soviet economy and deprive Nazi Germany of Soviet resources. Operation Pike was the code-name for a strategic bombing plan, overseen by Air Commodore John Slessor, against the Soviet Union by the Anglo-French alliance. British military planning against the Soviet Union occurred during the first two years of the Second World War, when despite Soviet neutrality, the British and French came to the conclusion that the Nazi-Soviet pact made Moscow the ally of Hitler. The plan was designed to destroy the Soviet oil industry, to cause the collapse of the Soviet economy and deprive Nazi Germany of Soviet resources. Even before the Nazis had occupied France, the UK and France had planned to bomb Russian oil fields to stop Hitler’s advance through Europe. But if the Allies had gone forward with their plan, it would have forced Nazi Germany and Stalin’s Soviet Union to forge an alliance together against the Allies. Even though Hitler and Stalin did form a kind of alliance for some time during the war it was short-lived – Hitler’s hunger for power saw the alliance disintegrate when he decided to invade the Soviet Union. The Allies, meanwhile, were undecided as to whether they should align themselves with the Communist Stalin. During all of this indecision, Hitler moved forward and signed the Molotov-Ribbentrop Pact with Stalin, which meant that Russia gained occupation of East Poland and the Baltic States while Hitler took the rest of Poland. It also meant that while Stalin’s troops were occupied in the East of Europe, Hitler could move westwards taking the Netherlands, Belgium and France. Stalin also agreed in the pact to provide supplies such as oil to the Nazi military, so that the German war machine could keep steaming ahead. Now the Soviet Union was an ally of Nazi Germany. 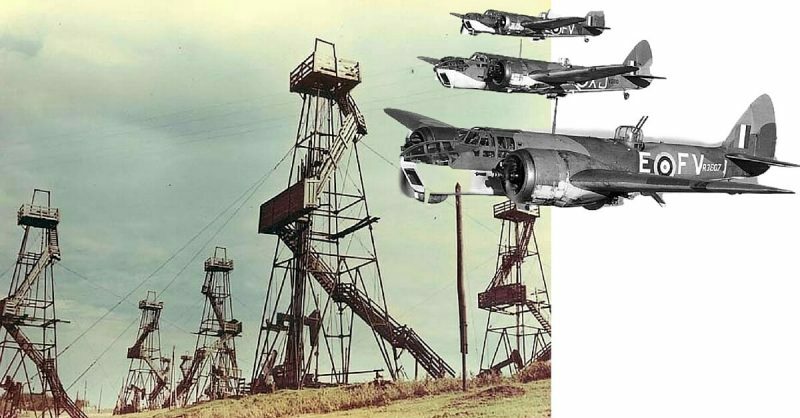 Operation Pike was developed to send British and French bombers over the Soviet Union to attack and destroy its oil fields, thus impeding and possibly stopping the advance of Germany across Europe. In March 1940, after the end of the Winter War, the British undertook secret reconnaissance flights to photograph areas inside the Soviet Union, utilising high-altitude, high-speed stereoscopic photography. Analysis of the photography by the PDU revealed that the oil infrastructure in Baku and Batum were particularly vulnerable to air attack, as both could be approached from the sea, so the more difficult target of Grozny would be bombed first to exploit the element of surprise. Oil fields were to be attacked with incendiary bombs, while tests conducted at the Royal Arsenal at Woolwich, revealed that light oil storage tanks at the oil processing plants could be detonated with high explosives. As of 1 April, four squadrons comprising 48 Bristol Blenheim Mk IV bombers were transferred to the Middle East Command, supplemented with a number of single-engined Wellesley bombers for night missions. A French force of 65 Martin Maryland bombers and a supplementary force of 24 Farman F.222 heavy bombers were allocated for night operations during the campaign. The French were preparing new airfields in Syria which were expected to be ready by 15 May. The campaign was expected to last three months and over 1,000 short tons of ordnance was allocated to the operation. The German Blitzkrieg and the swift fall of France from 10 May 1940 derailed the plans when the French military failed to hold back the Wehrmacht advance. The Germans captured a train stalled at the village of La Charité-sur-Loire that contained boxes of secret documents evacuated from Paris.Some of these documents were dealing with Operation Pike. On 4 July, in a propaganda campaign to justify the invasion of France, the German News Bureau released excerpts of the captured documents relating to Operation Pike. After the attack on the Soviet Union by Nazi Germany in Operation Barbarossa in June 1941, Operation Pike was revived as a contingency plan to be invoked if German forces occupied the Caucasian oil fields.